Though I would never relegate the entirety of videogames to the realm of baubles, mere toys that dwindle away the hours, I also see the value in idle play. That being said, sometimes I find it hard to reconcile my interest and background in world affairs with the amount of free time I currently spend playing, orchestrating, thinking about, and writing about videogames. So it was with great excitement I read an excellent article in the April issue of Wired magazine by John Bohannon , illustrating how game design applies to real world solutions. The Community-Wide Experiment on the Critical Assessment of Techniques for Protein Structure Prediction (CASP) is a biannual competition in which teams of biochemists compete in the advancement of complex protein folding, which can help scientists learn more about the cause and treatment for such conditions as Alzheimer's, Parkinson's, AIDS, among others. The reason CASP exists is because the task of finding the correct fold that allows a polypeptide to function properly is incredibly daunting. "Just 50,000 protein structures have been cracked since the late 1950s, while the sequences of millions of protein coding genes have been discovered in the past ten years alone." With only a relatively small cadre of scientists to work in this discipline, they have found ways to recruit. This is where gamers come in. For one, computing solutions takes a lot of processing power, so much so that the members of Stanford University's chemistry department asked for a little borrowed processing time from computer users around the world. So the chemists created Folding@home. Much like the distributed computing project Seti@home that allows users to search for signs of extraterrestrial life in our galaxy, Folding@home installs a small client program that utilizes your processor to conduct actual research. With a growing gamer consumer base in mind, Folding@home creators developed a client for the Playstation 3 in 2006. Right now, thousands of PS3 owners are conducting science in the form of a nifty screen-saver. Already the idea is inspiring, but even better than the insides of a PS3 are the insides of the human brain, with its uncanny ability to recognize patterns and pursue solutions for some of the most difficult puzzles. 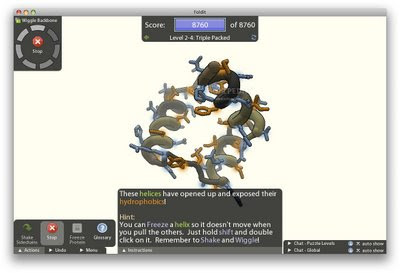 David Baker, a Seattle based biochemist who had already created Rosetta@home, a similar folding program, decided to team up with a computer scientist and tap into the human potential by creating Foldit, a protein folding game, a collection of science puzzles solvable by the gaming community. "Players use the cursor to grab, bend, pull, and wiggle the chain of amino acids anywhere along its length, folding the protein into its optimum shape. The only rules are based on physics—opposite charges attract, atomic bonds have limited angles of rotation, and the parts of the molecule that stick to water tend to point outward. The closer your model's properties adhere to those rules, the more points you get." OK, I admit, that may not sound exhilarating. It doesn't have the entrancing soundtrack or alluring art of Braid, but it is amazingly well built. The appeal for many, including myself, is due in no small part to the competitive and cooperative elements that allow users to help each other out and alternatively taunt others into progression. I am still a amateur protein folder, but the world chat channel and the puzzle exclusive chat channel provide a strange sense of community for a single player game. The result is exactly what Baker had hoped for, a sort of gamer hive-mind applied to science. There are high ranking teams, protein folding guilds, that tackle some of the harder proteins and have contributed several solutions to Baker's team at CASP. But even on the small scale, for those of us not solving complex puzzles, the community aspect is an interesting innovation that should be applied to other titles. Foldit's charm is not solely its almost MMO elements. Foldit is well polished. It has a thorough collection of introductory puzzles that put countless game tutorials to shame, a simple interface design, and an easily understood control scheme that still allow players to perform complex adjustments to protein structures. Foldit can also compete with any XBLA puzzle game for addictive entertainment value. Baker didn't just create a tool system, he created a great game with applicable results. Take that videogame naysayers. Such a creation only opens doors for innovative design challenges for the future. I can easily imagine applying solutions of games with broader scopes. Surely Sim City like games, with alternative rules and feedback systems, could contribute to our understanding of city planning and even emergency preparedness. Or perhaps gamers could use their collective intelligence to developed efficient agricultural practices, water resource allocation, or even simple inventions to solve puzzles that have stricken third-world countries for years. For Baker's team, games and gamers are immensely valuable. Foldit players will share the credit with Baker's team if their structures are applied to real world therapies. 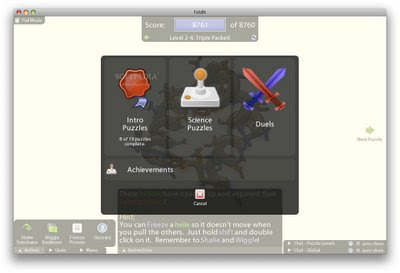 As bohannon mentioned "It might be the first time that a computer game's high score is a Nobel Prize." Clever designers outside the industry should recognize the applications games may have within multiple disciplines, seeing games as a resource. If Baker's creation is the standard, I'll gladly be a gamer scientist. "Or perhaps gamers could use their collective intelligence to developed efficient agricultural practices, water resource allocation, or even simple inventions to solve puzzles that have stricken third-world countries for years." Interesting article! I can totally see how game creators use real world solutions in game designing!